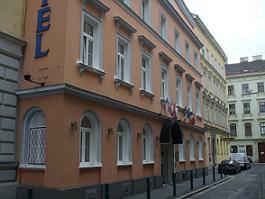 Hotel Adlon is situated in a quite street in an older renovated building. The pro’s: our superior room (i believe we booked a double room) was large with a seating area and bath/shower. It had modern windows which could be easily opened and a minibar. The room was clean, bright and modern. The twin beds were soft. Blankets/sheets were clean. The carpet looked new without stains. The breakfast is on the ground floor. It’s a buffet breakfast with enough space, pleasant seats and good food. The cons: there is no airconditioning (during our stay it was just a pleasant 23 degrees). Also the wired internet didn’t work which i didn’t like. There is no Wifi. I could use the free computer in the hotel lobby and this computer was allmost allways available. Also the windows in our room had two smaller windows above and these smaller rooms can only be closed standing upon a chair and the windowsill. Our daughter had a single room. It was much smaller but clean and had a shower. 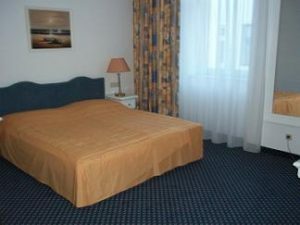 Hotel Adlon is a 3 star hotel in north Vienna. 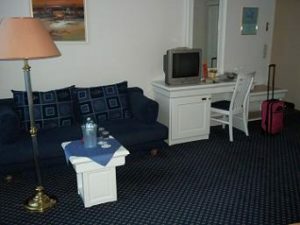 The hotel is located in a living area. It’s not the best neighborhood but not bad either. The hotel is near the Praterstern Station; it’s a 5 minutes walk to the station building. To reach the platform of the U-bahn is another 5 minutes walk. To Schwedenplatz (where the center of Vienna starts) is a 20 minutes walk. We didn’t walk to Stephansplatz but i estimate it’s 40 minutes from the hotel. We bought a 72-hours pass for unlimited travel by metro/s-bahn. Praterstern Station is one of the main stations in Vienna and has with metro U1 a direct connection to Stephansplatz. Other direct connections: S-bahn 7 to the airport and S-bahn 1/2 to Meidling Station. Trams lines are in front of the station. Inside Praterstern station are shops and a big supermarket. McDonald is at the station square. Some homeless people were hanging around on the station square in the day and evening. In the evening there was police surveillance at the station. We arrived at Praterstern Station in the early evening with the S-bahn 1/2 from Meidling Station (coming from Prague). The S-bahn stopped not in the main building but on a platform outside the building. We left the empty platform through an elevator/stair and a small tunnel to the road. But it is dark it can give an unsafe feeling.